TGIF, all! 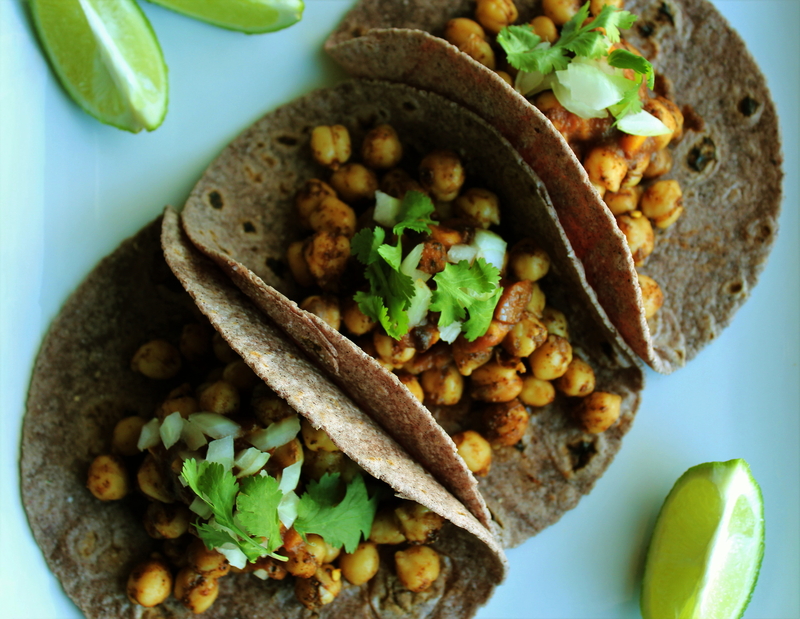 To celebrate the glorious forthcoming weekend, I’ve got this Spicy Chickpea Tacos recipe for ya!!! Let’s be real: whether it’s Friday or Tuesday or any other day of the week, these Spicy Chickpea Tacos are a good idea. For one, they are vegan, and while I’m a proud omnivore who enjoys supporting farms that foster ethically-raised animals by consuming their wares, eating plant-based meals makes me happy. I know that keeping my meat intake on the lower side benefits both environmental sustainability (since plants take less resources to grow than animals do) and my health. And also, I’m OBSESSED with chickpeas. I heart them whether they’re completely plain or jazzed up with a bunch of vibrant seasonings as they are here, so it was a no-brainer to incorporate them into one of my favorite dishes. Not only are they tasty, they’re an excellent source of fiber, protein, and essential vitamins and minerals such as iron and folate. 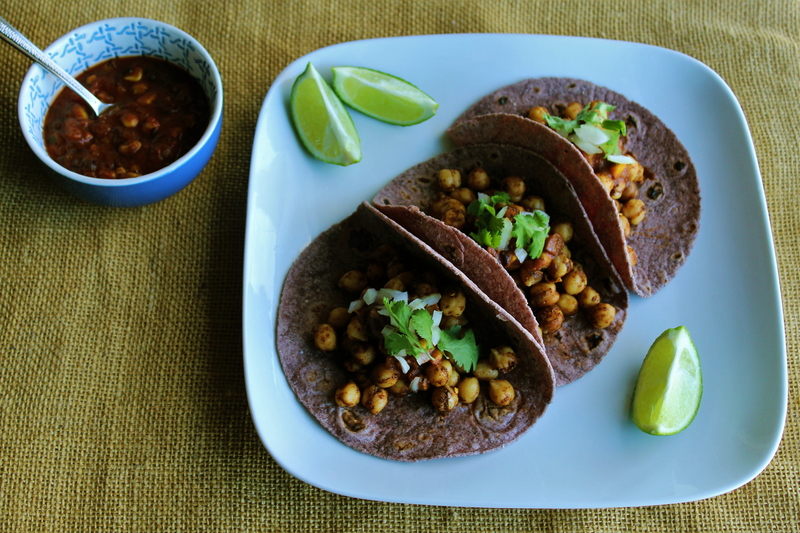 Speaking of the chickpeas: if you want your tacos now (I don’t blame ya!) and would like to avoid all of the soaking and simmering that dried beans entail, three cups of already-cooked chickpeas (two 15-ounce cans’ worth, drained) are the equivalent to one cup dried. You can decrease the amount of chili powder used from one tablespoon to two teaspoons. You can eliminate the crushed red pepper flakes. You can cut all of the seasoning measurements in half (and reduce the amount of water used from one-fourth of a cup to two tablespoons) so that the chickpeas are less liberally coated. OK, on to the recipe and all of that sweet, sweet taco-y TGIF goodness! -Toppings of your choice: diced onion, cilantro, salsa, diced tomatoes, sliced bell pepper, avocado, and guacamole are all great choices. And lime wedges add that extra burst of flavor! In a small bowl, mix together the spices and water. Add the chickpeas to a pan over medium-low heat and stir in the seasoning mix; heat until warmed (this should only take a few minutes). And that’s it! Warm your tortillas for about 20 to 30 seconds in the microwave; add the chickpea filling and toppings to them, and you’re ready to chow down! Makes about four to five tacos.